All-terrain vehicles, or ATVs for short, are hugely popular throughout the State of Florida, as both children and adults alike utilize them for endless hours of fun on both private trails and public roadways. For the most part, ATVs are considered safe and easy to operate. Be that as it may, an alarming number of both injuries and fatalities occur each year as a result of ATV mishaps. Causes for ATV accidents vary greatly. Some accidents are the simple result of careless operation of the vehicle by its driver. Sadly, alcohol continues to play a role in approximately one-quarter of all reported ATV accidents, and the attorneys at Brumer & Brumer cannot stress enough the importance of not getting behind the wheel of any motorized conveyance if you are under the influence of drugs or alcohol. Quite often, ATV accidents can be avoided, as ATV-related injuries and deaths are the direct result of defective equipment, unsafe trails, or simple carelessness and negligence on the part of another driver. If you or a loved one has been hurt in an ATV accident, we encourage you to call the Miami-based law firm of Brumer & Brumer to discuss the specific circumstances surrounding your case. We are experienced personal injury attorneys who have been championing the rights of our South Florida clients for the last five-plus decades. If another party was liable for injuries that you or a member of your family sustained while riding on an ATV, we would be happy to investigate all of the facts at hand and determine if you have grounds for a lawsuit. Our office offers complimentary initial consultations and we never charge a fee. If you do not recover any money to cover the costs of your medical bills, lost wages, pain and suffering, and the like, Brumer & Brumer would receive no compensation whatsoever. The risks of taking no action after an ATV accident are too great. Especially in consideration of the fact a majority of ATV accidents involve children under the age of 16. And with head trauma being the most common cause of ATV accident-related death and disability, the potential long-term risks could be dire. 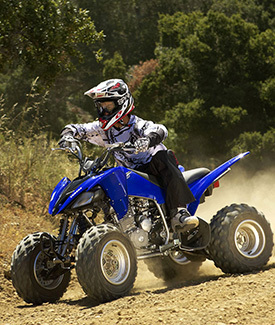 ATVs ostensibly should be manufactured to perform well on rocky dirt roads and other unstable patches of ground. But when an ATV driver is suddenly ejected, injuries are almost certain. These nearly inevitable injuries could include scrapes, cuts, broken and fractured bones, and disfigurement of the face and extremities. When an ATV flips over, the chances of much more serious, permanent consequences, such as neck and spinal cord defects, brain trauma, paralysis, and occasionally even death, are possible. Pinpointing the culprit in an ATV Accident can prove arduous at times. That's why the attorneys at Brumer & Brumer will set in motion every resource at their disposal to champion your rights and work to earn you a monetary award. Our top priority, at all times, is ensuring those who are liable for the pain and suffering of our clients are held fully responsible. We encourage you to call Brumer & Brumer in downtown Miami today. We look forward to assisting you.